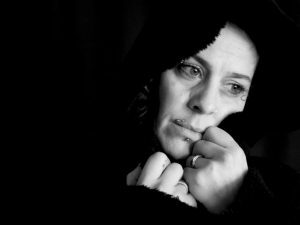 Do You Have an Ripped or Torn Ear Lobe? Let me share Karen’s story. It might speak to you. Karen loved jewelry. So when I ran into her after three years of not seeing her, I totally noticed that she wasn’t wearing earrings. My jeweler antenna started quivering. In what world would the vivacious Karen not wear earrings? Evidently the world where one ear lobe slowly ripped over time until a dance party and a heavy earring finished the job. Ouch. I usually notice when a friend of mine or future client is not wearing earrings. It’s often because one ear lobe is torn Partially or fully. Do You Have Ear Lobe Droop? 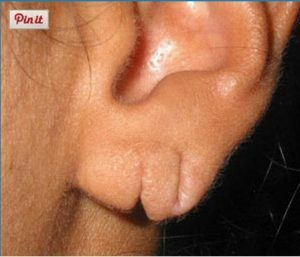 Ear lobe droop is caused by earrings tipping forward until they’re facing downward. Not only is this unattractive, it’s hard on your ears and ear holes. And one of the causes is ripped or enlarged ear holes. This totally limits your choices in which earrings to wear. 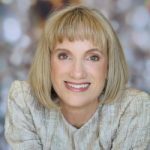 Today I’ll be talking about possible solutions to get you back into your pretty earrings. Seriously you need to wear your earrings! For the most part I’m talking about an ear lobe that is torn, but not all the way and is still usable. But this also addresses people with fully torn ear holes. What Solutions Are You Using? I’ve come across people who grew their hair to cover their lobes. I’ve seen people like Karen, who just quit wearing earrings! Don’t do that! I saw a client who had used tape on the bottom of her lobe to keep an earring high up. That was a good idea until it starts looking funky. My jewelry blogging purpose here is to get this out in the open. I mean the feelings of people with torn ear lobes. Why? Because not wearing earrings is not the solution! And believe me people don’t notice half the stuff you think they do. You might not be there yet. Whatever level of action you are ready for regarding slightly or fully torn ear holes let’s see if while you wait we can get you back into some earrings. A torn ear lobe can make the un-pierced cringe if they see the tear. A torn ear lobe limits the styles of earrings you can wear successfully. A torn ear lobe may rip more if you put heavy earrings in it. A torn ear lobe seriously limits your choices of dangly earrings styles. Have your jeweler move the post down lower so the earring design rides higher on your lobe and hides your torn ear lobe. 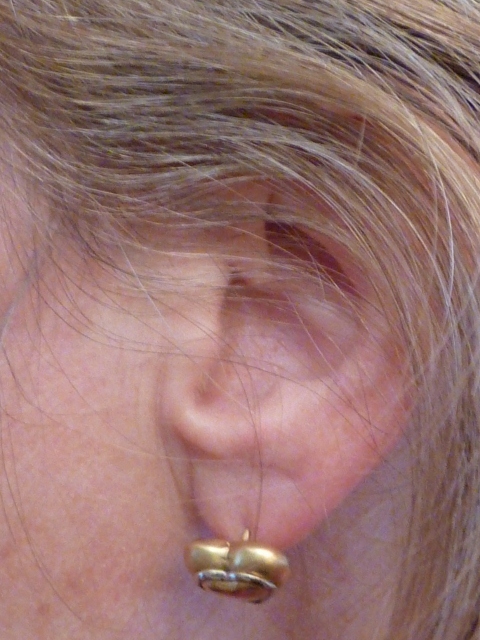 Moving the Post Lower Makes the Earrings Ride Higher, Hiding the Ear Hole. 2. To support your torn and weaker ear lobe area, use monster backs, plastic disc backs or Silicone Sliders, which provide support and take the weight of your earrings away from the bottom of your ear hole. 3. Get a plastic surgeon to repair it. By A) sewing it up or B) Sewing it up and adding filler. 4. Choose French Clip Backs with low-set posts. This makes the earring ride higher on your lobe. 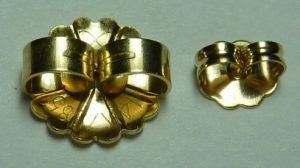 Traditional French Clip Backs have a post well below the top of the earring and a clip that takes the weight of the earring and holds it upright and pertly. 5. 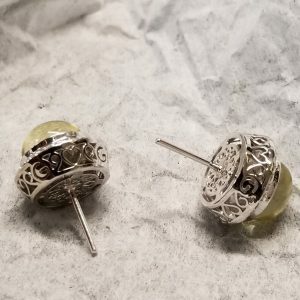 If your post is too high, (in other words if it would totally sag on your ear because it is at the top of your earring, an iffy look even with a normal ear lobe.) 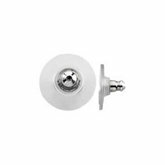 lift your earring so the post is at the top of the ear hole and put on the monster back or plastic disc back tightly enough to hold the earring in place. Avoid wire backs, lever backs and drop earrings with tiny or wire tops that expose your ear hole to the full weight of the earring. More tearing can occur from these. 6. 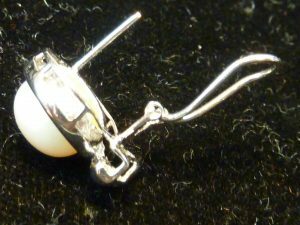 Change the tops of your dangly earrings to larger ones that hide the tear when worn with monster or plastic disc backs. If you lift the post to the top of your ear hole and snug your backs in fairly tightly, your earrings will stay up high and not pull on the bottom of your tear. The new larger earring fronts will nicely balance the large backs in gently squeezing your ear lobe to hold your earring so it does not pull on the bottom of your ear hole. Why You Must Wear Earrings! Don’t Wear These. It’s a Preemptive Move to Stop Ear Lobe Tearing. Hillary Duff! Girl are You Listening? Your eyes are the windows to the world. Earrings enhance the beauty of your eyes. You know you spend buckets of money and time on your hair. (I do!) Earrings enhance the gorgeousness of your hair too. Jewelry is the spice of any outfit. Earrings frame your face and enhance your look beautifully. Don’t leave your most important beauty aid in a box! My client Karen chose monster backs for her ears and is now wearing earrings again! A visit to the plastic surgeon is on her wish list. But until then a combination of monster backs and choosing lighter weight and large at the top, earrings, is keeping her looking her vivacious gorgeous self. And happily my jeweler antenna is relaxed and happy. Milla Jovovich’s Eyes Glow With the Help of Same-Color Earrings. Wear It Don’t Warehouse It. It’s just a torn ear lobe, not a death sentence! 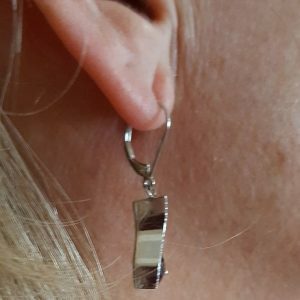 Wear your earrings!! Ear Lobe Droop: Are Your Earrings Pointing Toward the Pavement? Wonder Bra For Your Ear Lobes! Why Not Re-Use Your Old Gold? This is so in depth about torn ear lobes. It’s a tough subject, but one I’m not surprised that you wrote about! I’m glad to read about monster backs and I already knew about disc backs. The wonder bras for your ear lobes are a great idea. How do you find these things? Anyway I like your comment about our eyes being the windows to the world and the importance of wearing earrings. This is a good public service article and I hope a lot of people see it. Excellent post, Calla, on a very important subject. Brava! I stumbled across these monster backs while searching the internet for a solution for droopy earrings. Calla Gold saved me!! 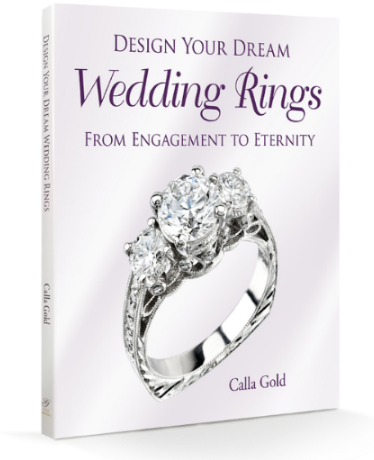 I completed the entire ordering transaction via email, Calla and Jeremy were very responsive to my questions, and when the backs arrived, I was thrilled!! They fit my earrings perfectly and look great! I’m so happy to be able to wear my earrings. and the disc back and wonder bra. Can you send this by mail i will appreciate for this. Wants to know the price first.